And I certainly did not intend to don a pair of skis again any time soon. 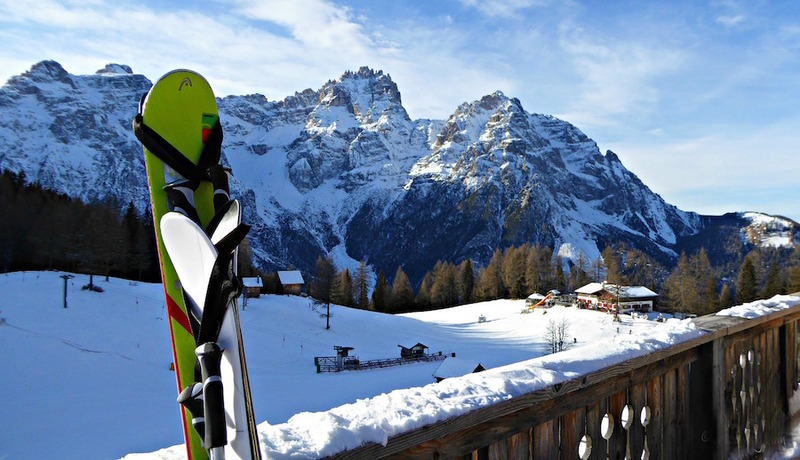 However, the ‘Man in My Life’ has always enjoyed La Settimana Bianca (white week), which is traditionally when Italians take to the mountains for a week of skiing. I was persuaded to pack my furry boots and thermals and to prepare for a trip to the Italian Dolomites. This, the first of our two ski weeks together so far, was to be my introduction to all of Tom’s Italian, American and Canadian skiing friends and I looked forward to meeting them all for the first time. I imagined that most, if not all, of them would be away skiing every day while I lounged around a roaring fire with a book and a mug of piping hot chocolate for company, while fat snowflakes fell outside. I was anticipating a week of indolence and complete rest. 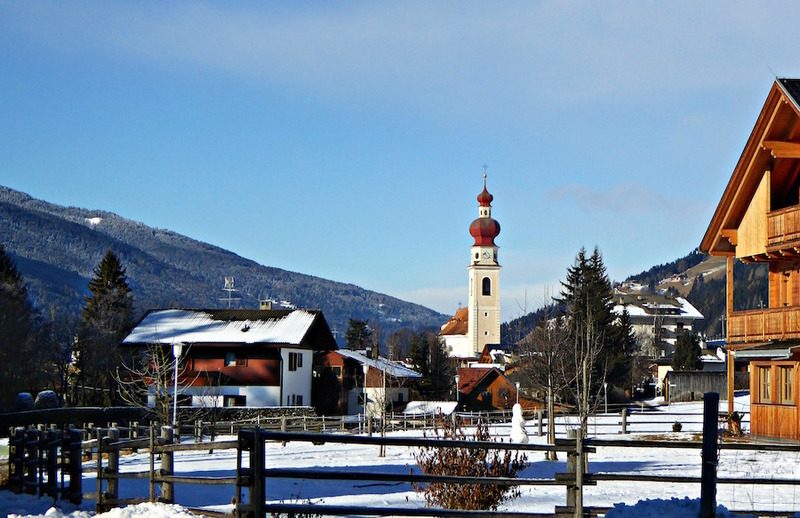 Arriving in Villabassa-Niederdorf, a small town in the South Tyrol, for the first time, I noted that the quaint cobbled streets were suspiciously free of the white stuff upon which people ski, or, in my case, hoped to walk on in furry boots. I need not have worried. First of all, these days in the absence of adequate snowfall, the ski runs are routinely covered in snow manufactured by special machines that blow it out in great white gusts. Secondly, Mother Nature delivered the hoped-for snow within a couple of days, turning the lower slopes and little alpine towns into a picture-postcard idyll. The Dolomites are particularly beautiful; jagged peaks soar skyward and valley floors are studded with picturesque towns and turquoise lakes; many of them covered in ice at this time of year. My dreams of sitting by a roaring log fire were soon shattered by the realisation that there were many non-skiers among the friendly group assembled at the Hotel Adler. As a result, on a daily basis, I happily visited many of the local towns and headed uphill on cable-cars and gondolas to various rifugi (wooden chalet-type restaurants) with terraces overlooking the most stunning scenery imaginable. On my first trip to the Italian Dolomites I met up with Linda, who had travelled all the way from Canada to join her daughter Trina, a keen skier. Linda was, like me, a non-skier and we soon bonded over the Pear Williams. Before long we were travelling to rifugi far and wide for long leisurely lunches on sun-drenched decks in the snow. On one morning, we visited Cortina, where we strolled around the tempting, expensive shops whose windows were filled with mink coats and jewellery, then took a cable car up to a rifugio by the name of Col Druscié where we had a delicious lunch of cold meats and cheeses washed down by the local red wine; in this case a robust Pinot Noir from the Sud Tirol – Alto Adige. The expression ‘ladies who lunch’ took on a new meaning altogether! 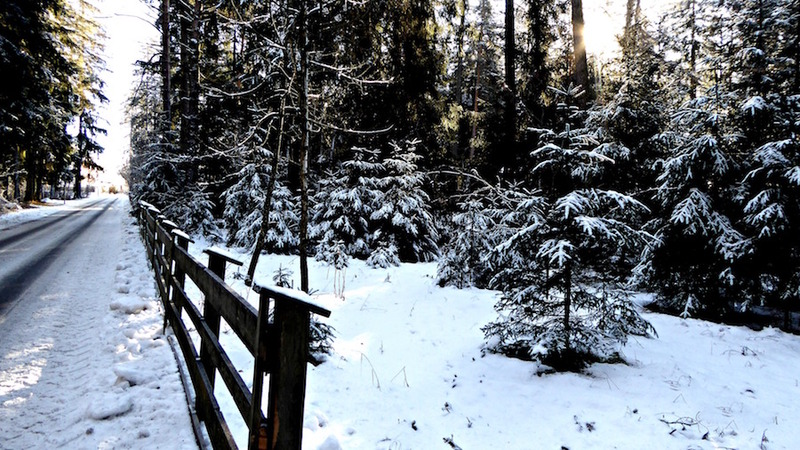 I cannot adequately describe the fantastic surroundings on our days out and about in the snow. The beauty of the clear blue sky and dazzling sunshine, coupled with the snow-covered mountains took my breath away. 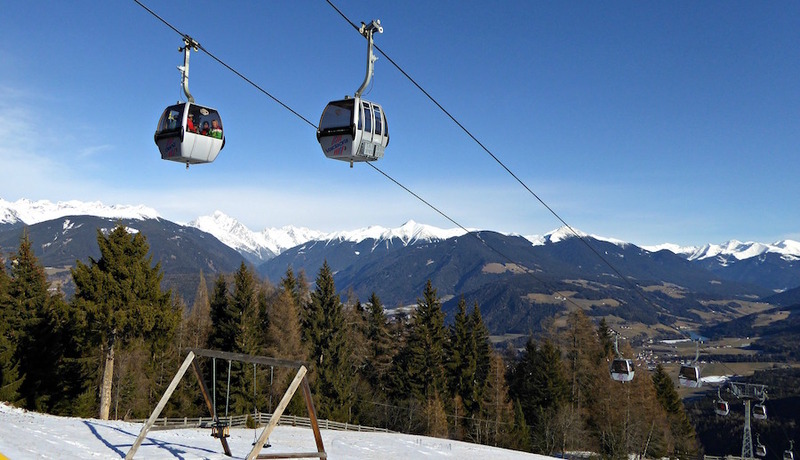 Travelling by cable car, suspended high over the pine trees, I felt as though I was in a dream. Some days, we met the skiers themselves for lunch. We would arrive first and park ourselves in the sun without as much as a hair out of place while watching our friends arrive fresh-faced from their downhill runs. There was always a great deal of camaraderie around those lunch tables, while tales of derring-do and spectacular falls ruled the conversation. Food was hearty and plentiful. 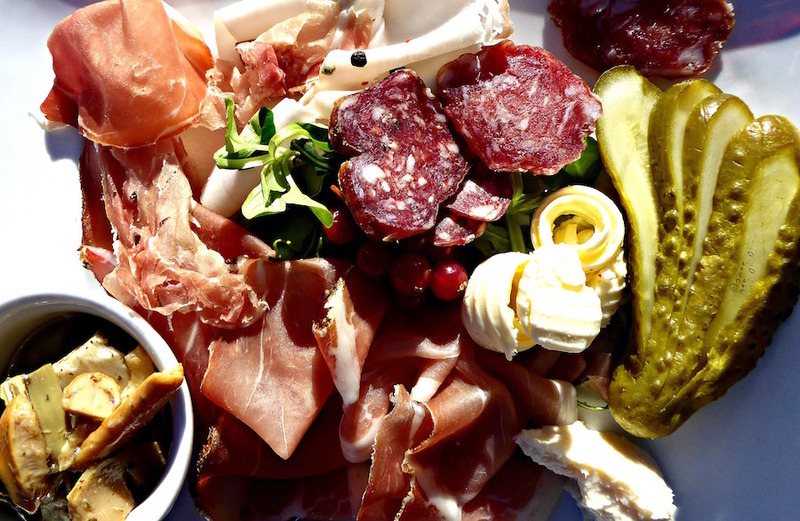 I ate speck and salami with horseradish sauce, pickles and brown bread made with fennel. Pastas, being Italian, were mouth-watering and the desserts were truly sinful in the way that only a good dessert can be. The local wines were excellent too. 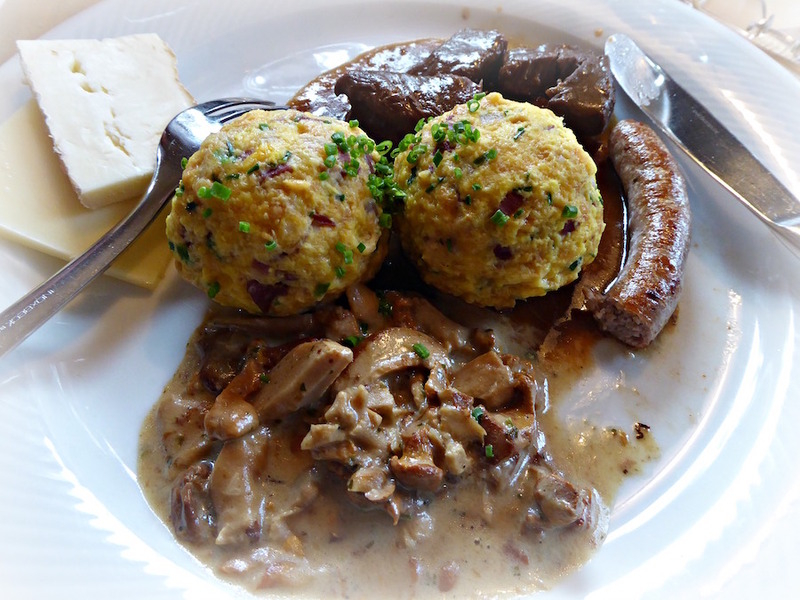 I particularly liked Lagrein, which is red, full-bodied and went perfectly with the meats and rich goulash. 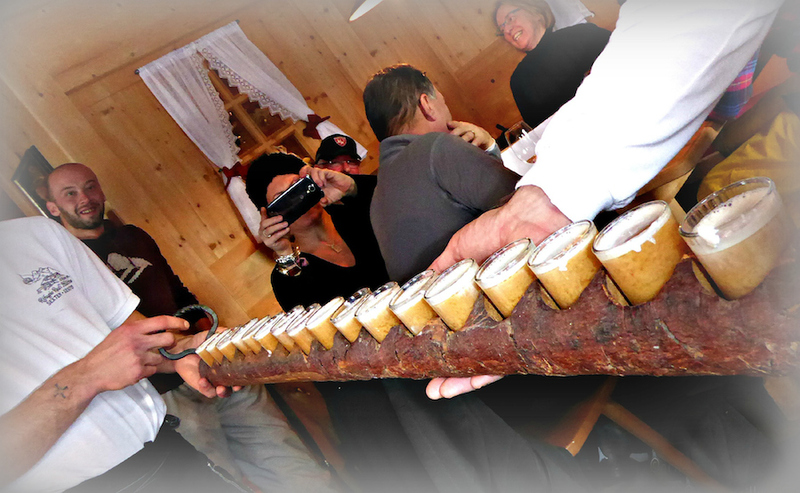 We lunched at Lorenzi Hutte, where the canederli (dumplings) were hot, delicious and nourishing; just the thing for the snowy weather. We met up with our group at the Rudi Hutte on Croda Rossa. Here the grappa was served in little glasses arranged on a long hollowed-out branch, which certainly got the seal of approval. 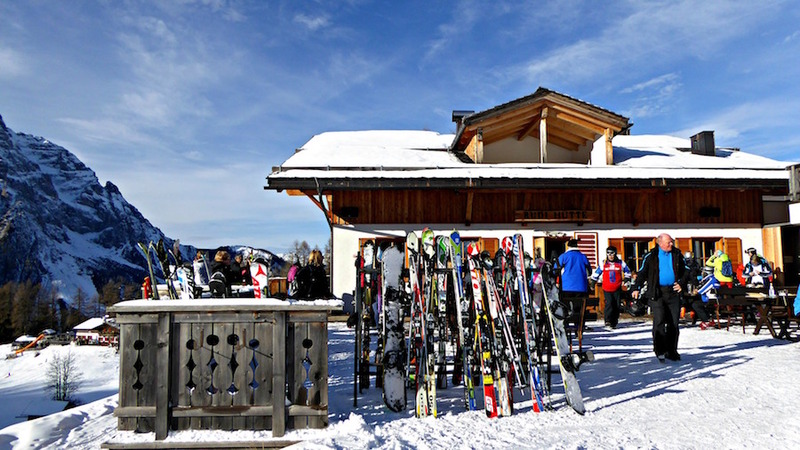 On another day it was Rifugio Henn Stoll-Pollaio, where spicy grilled chicken wings were the most popular dish. In order to burn off some of the calories that were, inevitably, being consumed, we did lots of walking along the river bank in picture-perfect Villabassa and out along the railway tracks where the ski train regularly passed us with its carriages full of skiers. Dinner was served at Hotel Adler where we ate splendidly every evening. Helene Markart, our excellent chef, has even written a book on regional cooking. When our settimana bianca week ended, we reluctantly left our cosy hotel, where Christian, the owner, made sure we were utterly pampered. On January of this year I visited Villabassa again with Tom and had a fabulous time once more, visiting even more picturesque towns and rifugi. I must mention that I never did manage to get any reading done during either of my non-ski weeks in the Dolomites, though I did notice the huge log fire as I passed through reception on my way to dinner or sped past on my way out for another day in the snow. Unfortunately, we will not make it to Villabassa this coming January as we moved to Puglia a few months ago and have too many commitments. How I will miss my non-ski week! Hopefully we will return next year.